The final day of the Abu Dhabi Grand Slam 2017 witnessed a historic meeting between the Presidents of the International Judo Federation, the U.A.E Judo and Wrestling Federation and the Israel Judo Association on #WorldJudoDay 2017 in Abu Dhabi. 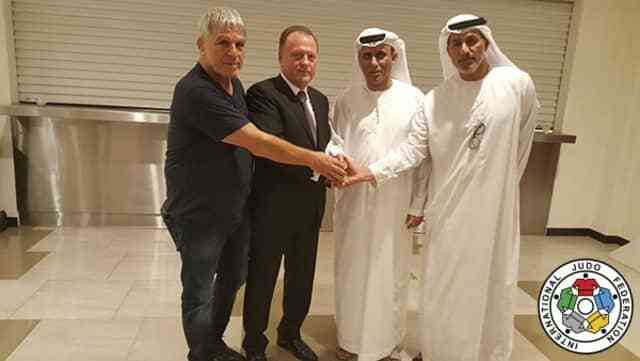 Following the final day of competition and the remaining five heavyweight weight categories being decided, the Israel Judo Association President Mr. Moshe PONTE (below - left) wished to thank his U.A.E counterpart, His Excellency Mohammad Bin Thaloub AL DARIE (centre - right), for the hospitality that was shown to the Israel team in Abu Dhabi who won five medals under the name of the International Judo Federation. Mr. Marius VIZER (centre - left), IJF President, Mr. PONTE, H.E AL DAREI and Mr. Naser AL-TAMEEMI (right), U.A.E Judo, Wrestling and Kickboxing Federation General Secretary, shared greetings and a positive discussion at the IPIC Arena as the world witnessed a historic meeting on #WorldJudoDay which is the IJF's annual day of celebration for all judoka and marks the birthday of judo founder Jigoro KANO. 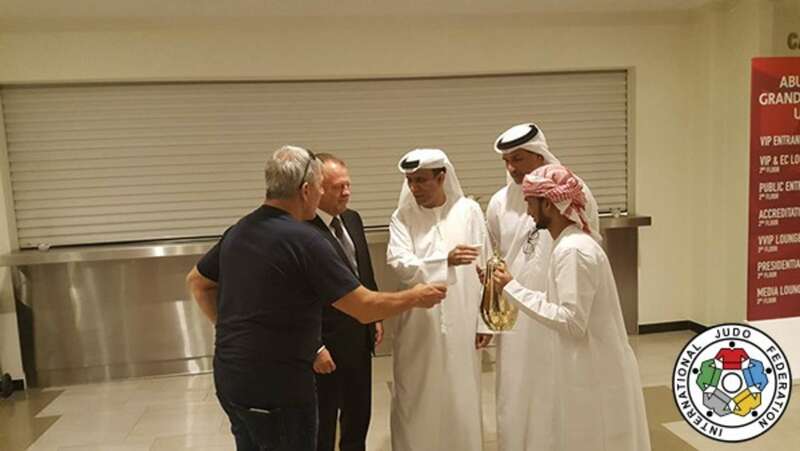 Mr. VIZER declared: "It was a gesture of courage, on #WorldJudoDay the President of the U.A.E Judo Federation President, His Excellency Mohammad Bin Thaloub AL DAREI, and Mr. Aref AL-AWANI, General Secretary of Abu Dhabi Sports Council (ADSC), apologised because of the U.A.E athletes not shaking hands with the Israel athletes and also congratulated the Israel team for their success here. "This was a gesture of courage, humanity and resect for the sport. "Sometimes with courage, respect and politeness, you can solve tensions and conflicts, which have not been solved since many decades. I consider, that even without the flag and anthem of Israel, that their team have been treated very well with high respect during this event. Two years ago we achieved the first participation of Israel team in Abu Dhabi, now it's the second time, but with a much better approach and I hope in the near future we can achieve the best condition of participation for the Israel teams. "Such delicate issues between countries, governments and nations cannot be solved overnight and cannot be solved through the sport immediately. "In the last years the IJF has made a lot of work and important steps for the participation and recognition of the Israeli team in countries like Morocco and Emirates and I hope soon we can break down more barriers for more tolerance between countries and nations to express the real value of the sport, friendship unity and solidarity." Saturday 28 October is one of the most important dates on the IJF calendar as the world observes #WorldJudoDay. Judo has 28 million practitioners worldwide and the IJF has encouraged all judoka and members of the judo family to celebrate their sport and their involvement in an activity which is known as being a martial art, an education tool and an Olympic and Paralympic sport. 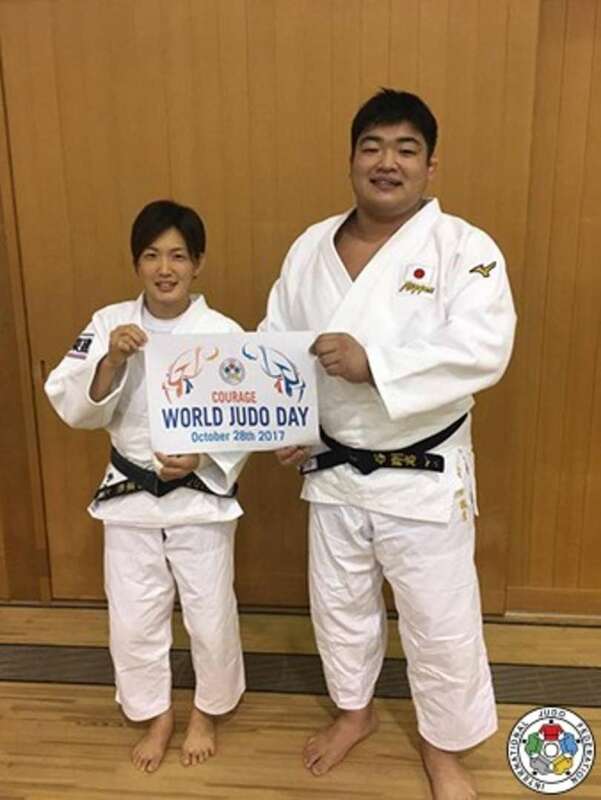 Rio 2016 Olympic silver medallist HARASAWA Hisayoshi and former world champion UMEKI Mami were among the Japanese team members to take part in a special #WorldJudoDay training judo session during a domestic training camp. This year, the All Japan Judo Federation engaged in #WorldJudoDay activities for the first time while the Kodokan Judo Institute continued to deliver their unique and exclusive tributes to Jigoro KANO. 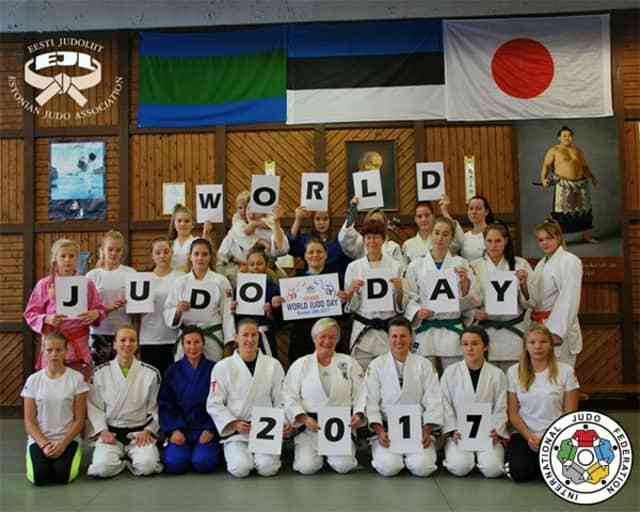 Estonia celebrated #WorldJudoDay by hosting a judo seminar for women and girls to honour the world's female judoka. During the weekend, women and girls gathered to discuss the power of judo, judo's moral code and the impact of positive role models. During lectures and workshops they talked about different career paths in the sporting world and how to get more girls active in judo in Estonia. Judoka from the age of 9 to 60 came together to train, inspire each other and to empower more girls to be active in the sport they love. 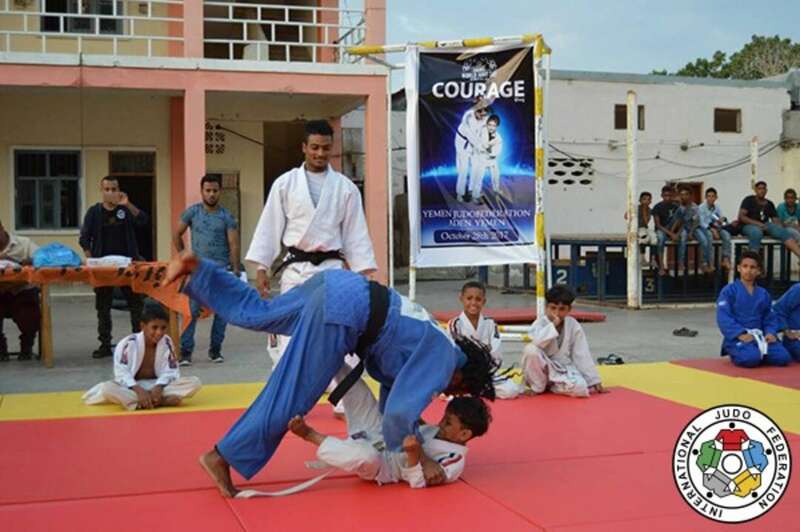 The Yemen Judo Federation held a special #WorldJudoDay training session for children and adults. There was a technical workshop where children were taught new techniques and were able to take part in randori with adults. All participants received a #WorldJudoDay diploma and a slice of cake which displayed the 2017 #WorldJudoDay theme Courage. All 2017 #WorldJudoDay projects will be featured here. The Openweight World Championships will return this year in Marrekech, Morocco from 11-12 November. The two-day competition was last held in 2011 and returns with the biggest names in the sport among an all-star entry and a record amount of prize money of 500,000 on the line as well as two world titles. Double Olympic champion and nine-time world champion Teddy RINER (FRA) will be bidding for a record-breaking 10th world crown and gold in Marrekech would also be worth a record 100,000 to judo's heavyweight king. Judo's youngest male Olympic champion Ilias ILIADIS (GRE) will come out of retirement to compete in Morocco. The all-time great retired after Rio 2016 but could not resist the chance to take on an Openweight field housing names such as RINER, Beijing 2008 Olympic champion NAIDAN Tuvshinbayar, Olympic silver medallist Varlam LIPARTELIANI (GEO) and a new batch of exciting young heavyweights led by European champion Guram TUSHISHVILI (GEO). The women's openweight category features Beijing 2008 Olympic bronze medallist, London 2012 Olympic champion and Rio 2016 Olympic silver medallist Idalys ORTIZ (CUB) who could meet world silver medallist and one of the early favourites for women's heavyweight gold at Tokyo 2020 in ASAHINA Sarah (JPN) who starts for Japan in Africa. World and European bronze medallist Natalie POWELL (GBR) become her country's first world number one on the official IJF World Ranking List by winning her first Grand Slam gold medal on Saturday. The Welsh judoka 27, a 15-time Grand Prix medallist, faced off with 2009 world champion Marhinde VERKERK (NED) for gold in a rematch of their world bronze medal contest. World number eight VERKERK, 31, again came out on the losing side as 2014 Commonwealth Games winner POWELL beat her familiar Dutch opponent on shidos. 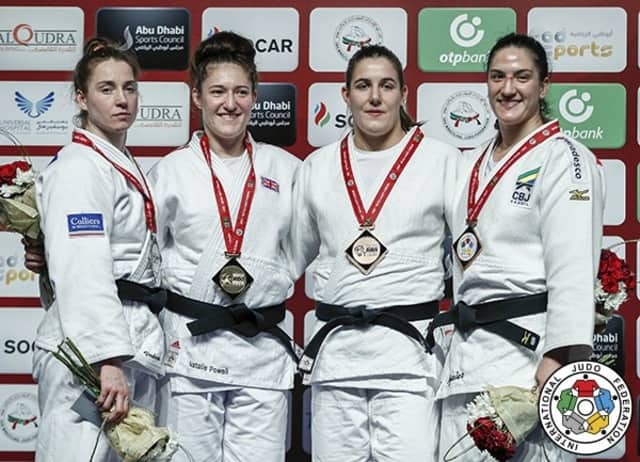 European Games champion VERKERK tired quickly in the final while POWELL pressed forward and set a fast pace that saw the referee reprimand the former on three occasions to receive hansoku-make which sent Irfon Judo Club product POWELL to the top of the podium and mean that there will be dancing on the streets of her hometown of Builth Wells tonight. 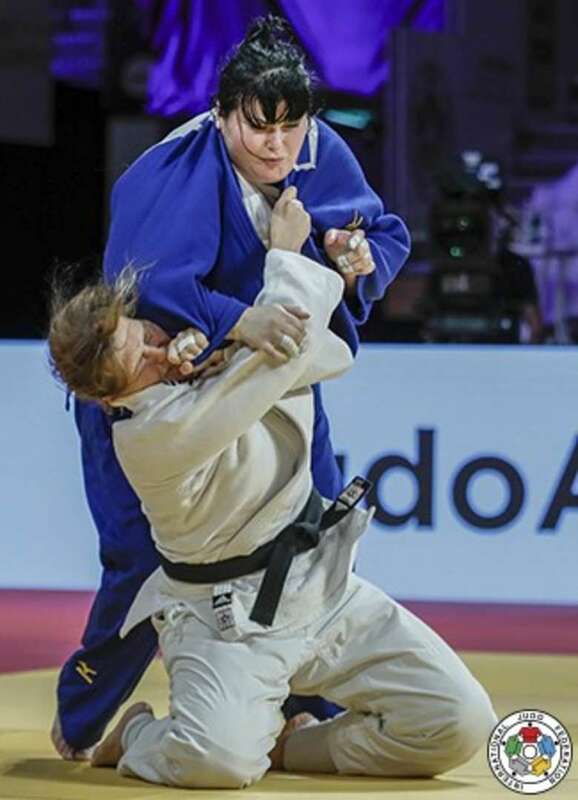 In the first semi-final world champion Mayra AGUIAR (BRA) was shocked by VERKERK when the Brazilian was penalised for the third time in golden score to receive hansoku-make. In the second semi-final POWELL beat former world number one Guusje STEENHUIS (NED) with a gutsy display. Five-time Grand Slam winner STEENHUIS was caught with a beautiful ashi-waza movement for a waza-ari score and POWELL did just enough in the closing seconds to avoid receiveing a third shido. The first bronze medal contest was won by STEENHUIS who put her semi-final defeat behind her to salvage another medal for the Netherlands by besting European Championships bronze medallist ERDELYI-JOO Abigel (HUN). Both judoka looked frustrated that they were contesting a bronze medal contest rather than the final but they matched each other for determination as neither judoka wanted to leave the U.A.E empty-handed. A last-gasp ashi-waza attack form the Dutch fighter sent her Hungarian adversary over for a waza-ari score for bronze. The second bronze medal was won by AGUIAR who pulled away from European u23 Championships silver medallist Antonina SHMELEVA (RUS) in the last minute of their contest. AGUIAR was competing for the first time since becoming a two-time world champion and reaped the supporting leg of the Russian with 55 seconds left for a waza-ari score which proved decisive when the time expired. 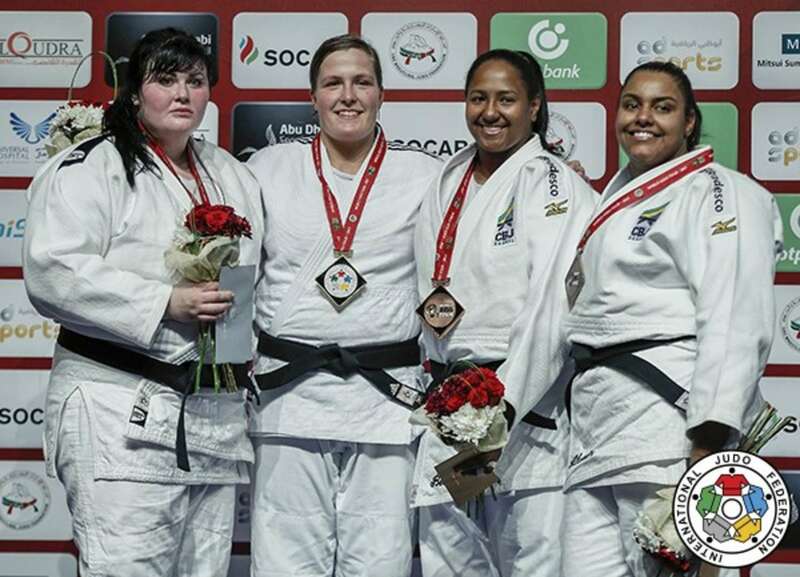 Baku Grand Slam winner Tessie SAVELKOULS (NED) provided heavyweight gold for the Netherlands with a win against world bronze medallist Iryna KINDZERSKA (AZE) to move her country up to second in the medal table. The Netherlands hit the medal trail in Abu Dhabi and can now look forward to their Grand Prix in November with great expectations and especially after the positive medal-winning displays from their youngsters a week ago in Zagreb, Croatia at the Junior World Championships. Number two seed SAVELKOULS defeated KINDZERSKA by shido penalties when the Azeri was given a third for a false attack. In the first semi-final SAVELKOULS defeated Ekaterinburg Grand Slam silver medallist Jasmin KUELBS (GER). The German heavyweight offered a toothless performance as she picked up three shidos in as many minutes to receive hansoku-make. 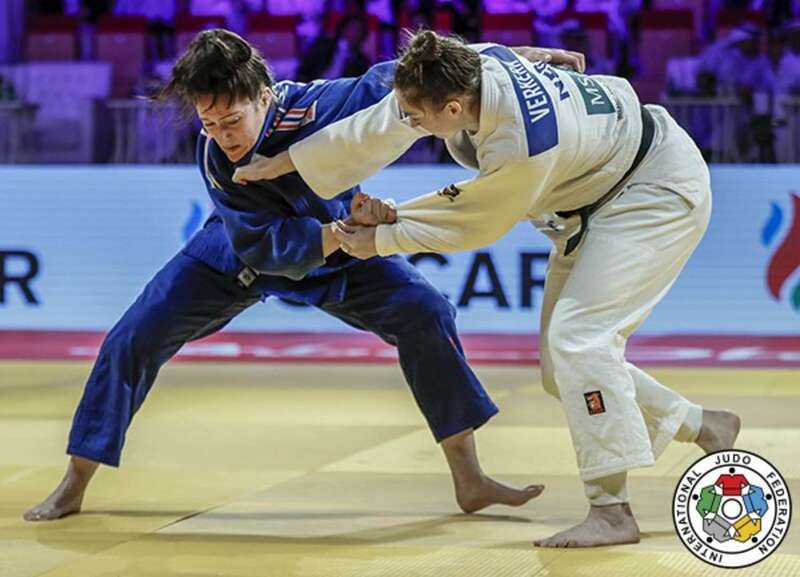 In the second semi-final KINDZERSKA defeated former Tokyo Grand Slam bronze medallist Ksenia CHIBISOVA (RUS) by ippon after only 25 seconds with an ouchi-gari. The first bronze medal was awarded to Pan American champion Beatriz SOUZA (BRA) who conquered CHIBISOVA by ippon to win her first medal on the IJF World Judo Tour. The 19-year-old Brazilian is a judoka on the rise and looks set to become a long-term feature for her country during the Tokyo 2020 Olympic cycle. The second bronze medal was won by two-time world silver medallist Maria Suelen ALTHEMAN (BRA) with her trademark harai-makikomi earning a waza-ari to defeat KUELBS after four minutes. 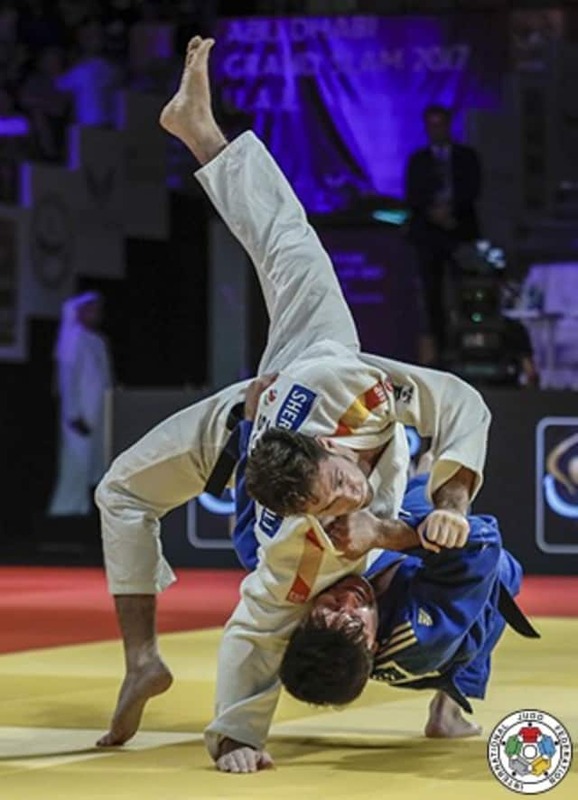 Cancun Grand Prix winner Nikoloz SHERAZADISHVILI (ESP) defeated former World Judo Masters winner Beka GVINIASHVILI (GEO) in a confident display as the 21-year-old stepped onto the highest place on a Grand Slam podium for the first time. 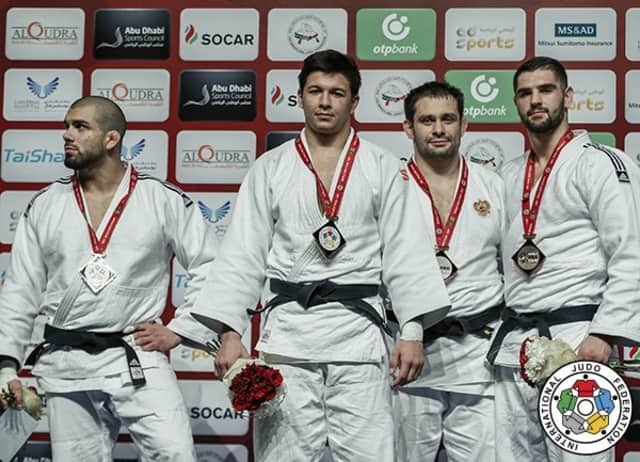 Tbilisi-born SHERAZADISHVILI, who moved as a child to Spain, was 0:2 in their head-to-head series but that defecit was cut in half as the Spaniard won the rematch of 2015 Junior Worlds final which also took place here in Abu Dhabi. SHERAZADISHVILI opened the scoring with a waza-ari from an uchi-mata and decivesly captured the top prize by countering a ura-nage for ippon. In the first semi-final SHERAZADISHVILI beat Glasgow European Open bronze medallist Zachary BURT (CAN) by a waza-ari score as the Spaniard secured his first Grand Slam final berth. In the second semi-final GVINIASHVILI thwarted Sarajevo European Cup winner Alexander ROSLYAKOV (RUS) after 18 seconds of golden score with a te-waza finish for a waza-ari score. The first bronze medal was won by Baku Grand Slam silver medallist Mammadali MEHDIYEV (AZE) against world number 264 ROSLYAKOV. The Russian was one of the most impressive judoka during the opening session but a weak ura-nage attempt was countered with pure te-waza for ippon after only 41 seconds in the opening contest of the final block. The second bronze medal went to BURT who defeated Tashkent Grand Prix winner Komronshokh USTOPIRIYON (TJK). BURT was fighting for a Grand Slam medal for the first time and won in golden score after 45 seconds when USTOPIRIYON tapped out while trapped in osaekomi. 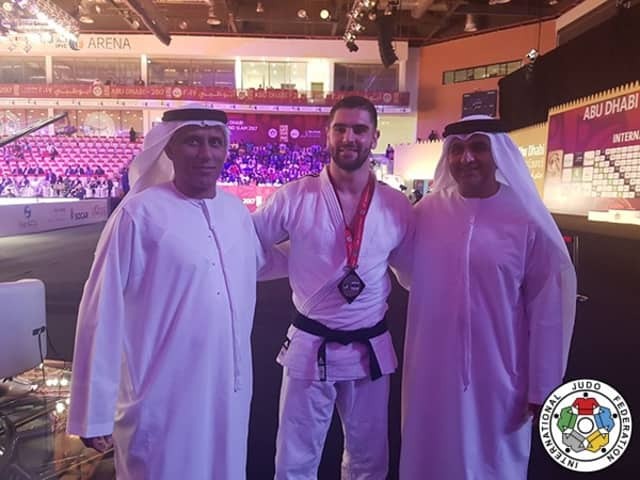 BURT had showed his ne-waza ability in the preliminaries and that area of his game yielded the best result of his career on the last day in Abu Dhabi. 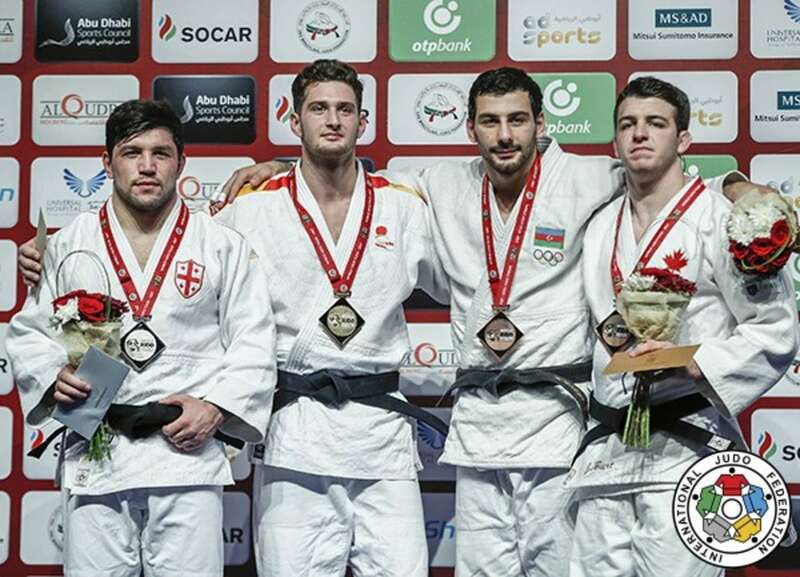 FISU Universiade bronze medallist Niiaz BILALOV (RUS) made a winning start to his first foray into a Grand Slam final as he beat former world bronze medallist Toma NIKIFOROV (BEL) to win -100kg gold. NIKIFOROV, who will take on judo's heavyweight titans in the Openweight World Championships blockbuster next month, fell behind to a waza-ari score from a drop seoi-nage but thought he had won the contest when he forced a submission on the ground. However, a video review showed that he had applied illegal pressure to the lower body of his opponent and the original awarding of ippon was cancelled. The contest continued and BILALOV made the most of it as he drove over his Belgian rival with an o-uchi-gari with 41 seconds left for ippon. In the first semi-final NIKIFOROV downed Ekaterinburg Grand Slam winner CIRJENICS Miklos (HUN) by a waza-ari which was the only score of the contest. In the second semi-final BILALOV saw off Zagreb Grand Prix bronze medallist Giuliano LOPORCHIO (ITA) by two waza-ari scores. The Russian scored his second with a drop seoi-nage towards the edge of the mat which all but ended the hopes of LOPORCHIO as BILALOV comfortably saw out the remaining time. The first bronze medal was won by five-time world medallist Kirill DENISOV (RUS) who beat LOPORCHIO with a late show for a place on the -100kg podium. A ko-uchi-gari earned a waza-ari score with 12 seconds left and there was not enough time for the trailing Italian to launch a comeback. The second bronze medal went to Cancun Grand Prix winner Peter PALTCHIK (ISR) who defeated CIRJENICS by a waza-ari score which was registered after only five seconds. PALTCHIK rocked his opponent with a sasae-tsurikomi-ashi and he was off balance to the point where he could use his upper body and momentum to complete the scoring technique. 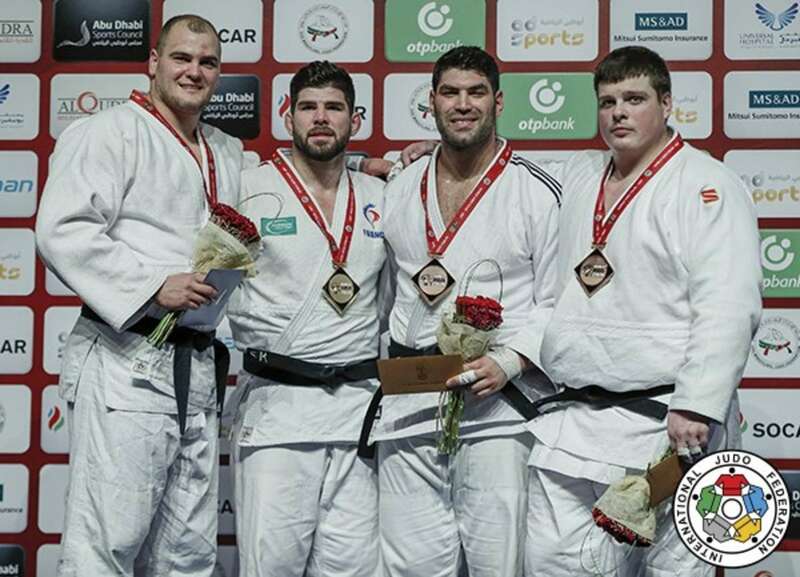 Olympic bronze medallist Cyrille MARET (FRA) won gold on his inaugural appearance in the heavyweight category as he defeated three-time Grand Slam bronze medallist Maciej SARNACKI (POL) in the +100kg final. MARET, who usually campaigns at -100kg, is preparing for the Openweight World Championships where he will compete alongside countryman and training partner Teddy RINER (FRA). On this early showing there is evidence that MARET -- who weighed 115kg while SARNACKI came in at 130.4kg -- could be a realistic contender to the 10th world title bid of RINER in Morocco. 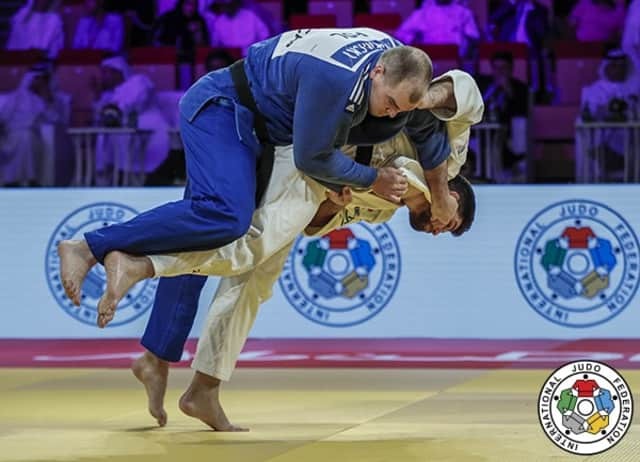 France's world number nine at -100kg won his country's only medal in Abu Dhabi from their seven-strong men's team by coming back from behind to hold down SARNACKI for ippon. MARET grinded out victories when he needed to and scored when he had an opportunity to record one of the most impressive debut heavyweight performances in recent years. In the first semi-final former Baku Grand Slam silver medallist Anton KRIVOBOKOV (RUS) lost to MARET after a third shido for passivity ended a wasteful performance from the Russian. In the second semi-final three-time SARNACKI screamed with delight as he defeated Rio 2016 Olympic bronze medallist Or SASSON (ISR) with a modified kata-guruma for ippon. The first bronze medal was won by Tashkent Grand Prix winner SASSON against former Zagreb Grand Prix bronze medallist Benjamin HARMEGNIES (BEL). SASSON, who will be one of the new crop of heavyweights expected to offer a stern challenge for RINER at the Openweight World Championships, emerged with the victory to claim his second Grand Slam medal by the advantage of a waza-ari score. The second bronze medal went to KRIVOBOKOV who powered past 2016 Abu Dhabi Grand Slam silver medallist Aliaksandr VAKHAVIAK (BLR) in a clash of true heavyweight brutes. KRIVOBOKOV scored two waza-ari before conceding one himself but had the maturity to retain his composure and pinned down VAKHAVIAK for 20 seconds and ippon.